John Sheehan (Oxford) Ltd completed all groundworks to create a new basement to provide living accommodation at a 19th Century Grade II Listed building in the Home Counties. Our team begun the project by identifying and protecting designated walkways and access points at ground floor level, followed by the containment and protection of heritage areas in the main hall and galleries area of the house. 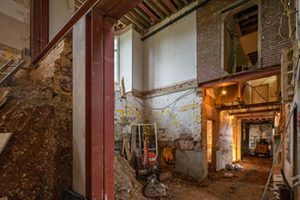 All remaining redundant pipework and services within basement were stripped out before the team installed universal beams throughout the ground floor area. We carried out a reduced level dig externally at the new plant room location down to the top of the existing foundations, externally installing new steel beams. On completion the next stage was to break through externally into the existing basement area. Elements of the building had to be preserved and were therefore carefully removed and saved in a safe location. 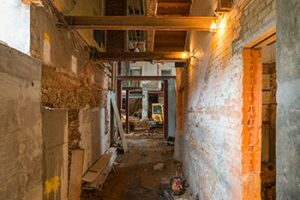 The existing floor of the basement was then taken up, followed by the careful removal of internal walls. This led on to a reduce level dig, excavating the underside of the existing foundations. All arising’s were removed from the basement and stockpiled as works proceed. 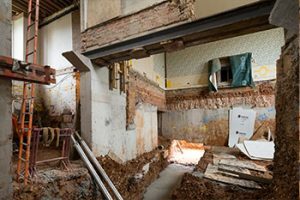 All underpinning excavation was carried out from the internal face of the basement. 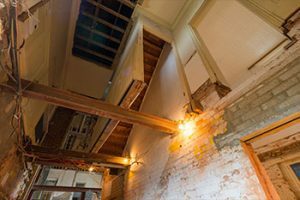 The basement was designed to provide extra living accommodation whilst preserving the Grade II features of the historic property.